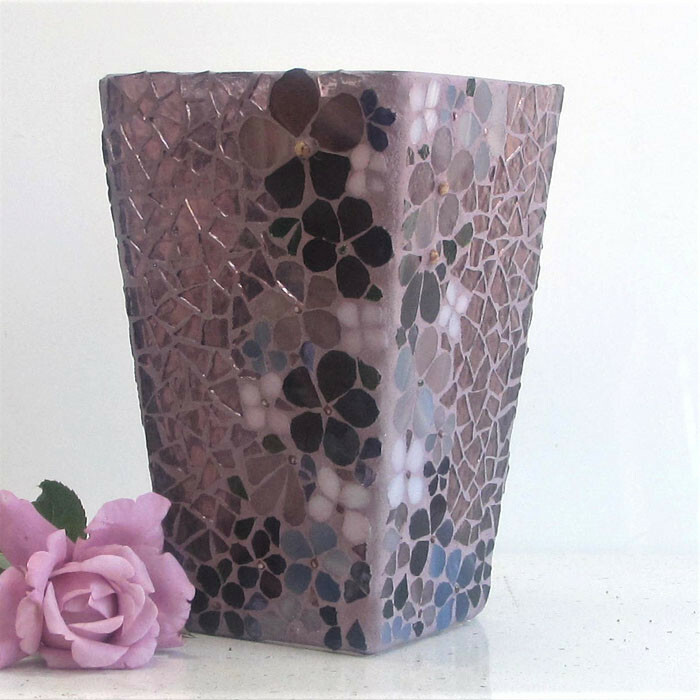 Lovely shades of mulberry purple with tinges of blue and white flowers cascade down this stunning vase. The flowers have been cut and shaped from shaded art glass, tiny beads form the flower centres. The flowers are on both corner sides opposite each other with the fill glass being a mulberry textured art glass that has been cut into random sizes. The glass used is semi transparent that allows the light to shine through therefore when the vase is in sunlight the colours are highlighted giving a "stained glass window effect "
The vase measures 20cm in height x 12 cm at the mouth tapering down to a 9 cm square base .